Acceleration of charged particles in a magnetic or electric field (synchrotron, or Lamour radiation). 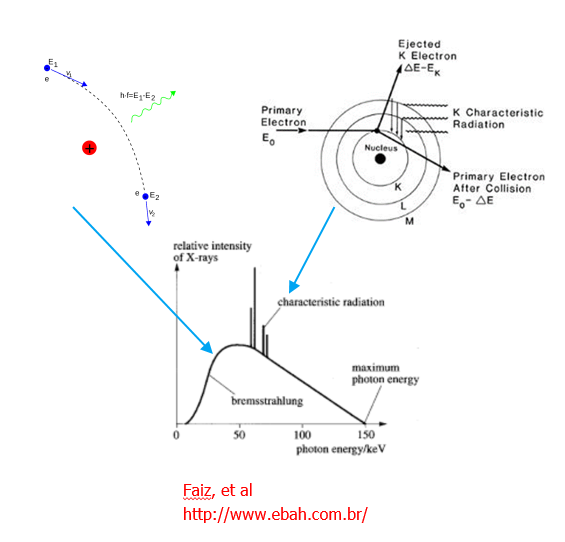 Acceleration of energetic electrons incident upon a material of high atomic number (bremsstrahlung – braking – radiation). Transition of atomic electrons from a high to low energy level. Scattering between low energy photons and ultra-relativistic electrons (inverse Compton scattering). These processes are responsible for X ray generation from both natural and man-made sources. For example, inverse Compton scattering of beta radiation produces X rays from some radioactive materials, and X rays from a number of astronomical sources, like the Crab nebula, result from synchrotron radiation – which is also the mechanism used by many man-made X ray light sources. Today we will concentrate on what we usually think of as an ‘X ray tube’ – in which the main mechanism of X ray production is bremsstrahlung. Let’s briefly consider the genesis and early development of X ray tubes. The first purpose designed source was the so-called Crookes tube, shown in figure 1 , developed from the tubes of the same name that were used to generate and accelerate ‘cathode rays’ – later identified as electrons. In 1895 Wilhelm Röntgen first noticed that the original tubes produced emissions – X rays -that could cause fluorescence outside the tube. These tubes used a cold cathode and contained residual gas at low pressure (<~1mTorr). A high voltage between anode and cathode generated a plasma, from which the ions were accelerated to the cathode, producing secondary electrons; these electrons were accelerated towards the anode – generating more ionization en-route – where they produced bremsstrahlung radiation. These tubes were not particularly reliable, and over time the residual pressure reduced as the gas was absorbed by the walls of the tube, and needed to be replenished by heating a side-tube containing a material that had previously adsorbed gas. The Coolidge tube, also shown in figure 1, invented by the eponymous Dr Coolidge in 1913, improves on the performance of the Crookes tube. It uses a hot cathode thermionic emitter – often a wound cathode filament – and operates at a higher vacuum. Electrons are accelerated towards the anode where is the X rays are generated. In this blog, we will concentrate on the Coolidge tube, which in principle is quite simple, and despite its age, modern tubes are still based on the same general concept of an electron emitter, accelerating/focussing potential and high atomic number target – although we might now consider cold-cathode, field-effect emitters as well as hot thermionic emitters as sources of electrons. In the X-ray tube we have a beam of energetic electrons incident upon a material of high atomic number. Deflection caused by the nuclear charge produces bremsstrahlung radiation – different degrees of deflection lead to a wide, continuous energy (and wavelength) spectrum, with the maximum at the energy of the incident particle – as indicated below. In the X ray tube we have a beam of energetic electrons incident upon a target made from a material of high atomic number. Deflection caused by the nuclear charge of this material produces bremsstrahlung radiation – different degrees of deflection give the radiation its wide, continuous energy (and wavelength) spectrum, with the maximum at the energy of the incident particle.While bremsstrahlung is responsible for most of the X ray generation, the spectrum also includes discrete energy peaks, produced when an electron is ejected from an inner shell by a passing particle, and an outer-shell electron falls to replace it, releasing a photon at the energy of the difference between the levels. Since the difference is characteristic of an atomic species, this is termed characteristic radiation. (We might call it fluorescence if the electron is ejected by a photon – this process can occur here if an X ray goes on to generate a photoelectron and subsequent X ray emission at a lower energy). We note here that in principle, the intensity of the bremsstrahlung radiation would increase linearly as the energy reduces; in practice, the X rays are produced at some depth in the material, and also need to pass through the wall or window of the tube. Some emissions are absorbed – the lower energy emissions being absorbed to a greater extent than high energies. This is known as inherent filtering; external filtering may also be applied to tailor the spectrum. Removing the lower energy components is beneficial for diagnostic X ray systems, since this region would be absorbed by the patient – increasing the dose – without giving diagnostic (transmission) data. When the electron beam hits the target, the spatial distribution of the X rays depends on the beam energy. At low energy, X rays are emitted almost isotropically, and most tubes have a window to allow X rays to be extracted perpendicular to the electron beam direction. In these, the target is angled so that the beam incidence is a few degrees off normal. This has two effects – firstly, as noted before, since radiation is produced at a small distance below the surface, the material of the target and anode structure absorbs some of the emission; the angle of the target reduces the attenuation of those X rays emitted perpendicular to the beam direction. However, varying attenuation close to the target surface grazing angles gives a taper to the X ray beam density on one side of the beam. This can be corrected by external filters, or can be used to minimize dose and give uniform contrast in imaging applications where the object tapers in optical thickness (this is known as heel filtering). Secondly, the apparent size of the beam incidence region (in the beam direction) is reduced by a factor of the cosine of the target angle. This smaller effective source region gives better resolution in imaging applications. As the beam energy increases, the X ray emission becomes more directed along the beam direction. The need to reduce target and anode structure absorption means that in some tubes, the target is a thin foil, allowing X rays to be radiated along the beam. Only a small proportion of the kinetic energy of the electrons is converted to X rays typically around 1% – meaning that significant amounts of heat would need to be dissipated if generating high power/long pulse X rays. This led to designs for rotating anode tubes that spread the heat load over an extended region as early as the 1890s, although the first practicable tube was made by Coolidge in 1915. We will come back to the issue of power dissipation later when looking at applications of X rays, and the consequent implications for source design and analysis. The processes that lead to X ray production only to highlight the need to generate, accelerate, transport and focus an electron beam onto a target. These are the processes we are principally concerned with when it comes to simulation. Opera does not simulate the basic interaction physics, but implements analytic or measured data for such processes as particle emission. As we will see later, we have the ability to include secondary emission in our simulations, and we could in principle represent the production of X rays as one or a set of such emission models. Each could be based on analytic expressions or measured data for the characteristics of the X ray spectrum – in terms of energy and spatial distributions. Let’s look at the components of a typical tube, as we would represent them in Opera. Source of electrons, often a hot filament thermionic emitter, biased at the cathode potential. Grid – electrode close to the emitter that can be biased to switch and control the beam current. Not always present, sometimes the cathode cup is used – biased at a variable voltage below the cathode potential. 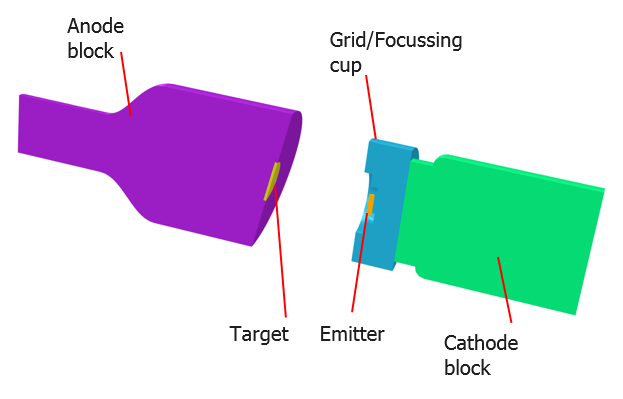 Focussing system – usually electrostatic – in many cases the focussing function is performed by shaping the cathode or cathode cup without the need for a separate, biased, electrode. Beam target – a high atomic number material, often tungsten, rhodium or molybdenum – depending on the application. The common attributes of these materials are high atomic number, which gives high X ray yield, since yield is proportional to atomic number, and high melting point – necessary because most of the beam energy produces heat, not X rays. The choice between materials to some extent depends on the application; for example, some diagnostic applications make use of the characteristic radiation (target material dependent), for which some photon energies are more advantageous than others – tungsten vs molybdenum, for example. The target is biased at the anode potential. Anode – biased electrode – accelerating bias determines the beam energy. The anode structure provides thermal mass and a conduction path away from the target, which typically forms part of the anode structure. It goes without saying the anode also provides the electrical connection to the target. As we know, the applications of X rays are many and varied. We can put some typical numbers on the range of parameters associated with X rays generally, as in figure 5 . Clearly, the range of each is quite wide, leading to different design issues, depending on the application, and where in parameter-space the tube needs to operate. However, we can identify those attributes of X rays that make them suited to their typical applications, as indicated in figure 6 . These attributes have varied relevance to each application. For example, in imaging applications, we are interested in both the ability of X rays to penetrate ‘solid’ structures to varying degrees – giving contrast. In therapeutic applications their use also relies on the energetic nature of the X ray photons.Given the typical components of an X ray tube, and the broad requirements of the applications, we will now consider the impact that these, and the mode of operation, place on the simulations that we need to perform. Particles and the fields – with self-consistent treatment of the effects of space-charge from the beam on the electric field and trajectory of the beam due to both electric and magnetic fields. Particles and surfaces where energy will be deposited and secondary particles might be generated, along with X rays. Particles and volumes – if we have residual gas, for example. Many X ray devices involve high beam powers, and even though the target is typically a high melting point material, such as tungsten, and the anode often rotates, thermal management can be a significant problem. Hence the thermal impact needs to be evaluated – along with the consequential stresses and deformations that occur from thermal expansion.Over the past couple of decades, or more, a number of Opera modules have been designed and developed that address the issues commonly met in the design of X ray tubes and other charged particle devices. These modules include solvers for electric and magnetic field, charged particles, thermal and stress, along with an optimizer and the facility to perform multiphysics simulations involving the relevant physics solvers. 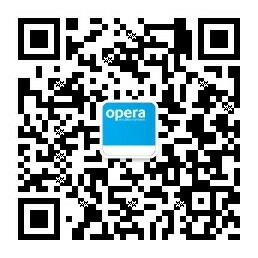 So we will consider what features Opera and these modules have that allow us to meet the requirements. Starting with EM/charged particle features, Opera’s field solvers are highly developed – accurate and efficient; this is perhaps the area for which Opera is best known. The electrostatic field solver is an integral part of the Charged Particle solver, where it is combined with self-consistent space charge and trajectory simulation. The Magnetostatic field solver can provide magnetic field values that may be imported into a Charged Particle model before it is solved to enable trajectory simulation in the presence of combined fields. 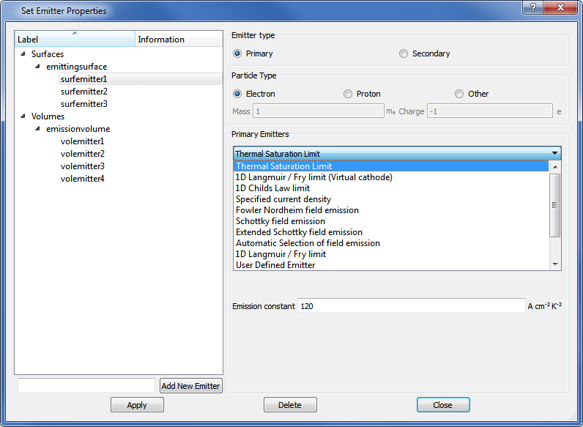 The Charged Particle module includes self-consistent primary and secondary emission models, including those relevant to the types of emitters that we would expect to find in X ray tubes. As the particles are generated and tracked, the solver accounts for the modification to the potential distribution caused by their charge – including at the surface of the emitters – modifying both the emitted current distribution and the particle trajectories. The magnetic field produced by the beam current can optionally be evaluated and included in the simulation. However, this is often only necessary for high beam-current devices – in most cases, the effect of the beam’s self-magnetic field is insignificant compared with that of the calculated electrostatic and applied magnetostatic field. Another option in a Charged Particle simulation is the inclusion of the effects of imperfect (lossy) dielectrics. If included in a Charged Particle simulation, the material can carry a bulk current, which modifies the electric potential distribution over the material, and hence modifies the electric field in the model. The Charged Particle solver evaluates the beam power deposited on surfaces – as the difference between the incident power and any power emitted by secondary emission from the surface. If running under the Opera Multiphysics facility, this deposited power distribution is automatically made available to the next stage of the simulation – usually thermal. For additional flexibility, the power distribution can also be exported in the form of standard-format ASCII data files (ie Opera table files), which may be used in, say, Opera thermal simulations, or third party applications. We will return to this a little later. So how does Opera go about performing a Charged Particle simulation? If we limit the problem to static fields and ‘continuous’ beams, i.e. to timescales longer than the device time constants, then we can think of the beam as consisting of a discrete set current tracks. The simulation task then comes down to finding the self-consistent trajectories of these current tracks. For these trajectories, the forces – caused by the interaction between the charge distribution of the beam and the electrostatic potential, and by the effective motion of the charge in the presence of a magnetic field – are balanced. To do this we use an iterative solution method. In the first iteration we calculate the electrostatic field distribution due to the potential defined on the electrodes. Using this, and any applied magnetic field, we generate and track initial particles through the device. At the end of the iteration we assign space-charge from the calculated beam current and energy distribution to the FE mesh. In subsequent iterations the electrostatic field is re-calculated including the effects of the new space charge distribution. Particles are re-launched and trajectories are updated. This continues until convergence to the user-defined level is achieved or the user-defined maximum number of iterations is reached. Perhaps surprisingly, the technique is fast as well as accurate. It allows multiple species, multiple interactions in practicable time scales. Such is the speed and efficiency of the technique that we can often contemplate multi-variable, multi-objective optimization, where other techniques might struggle to give a single case solution. Let us return to a fundamental aspect of simulations of devices such as X ray tubes, namely the ability to be able to generate electrons from emitting structures. These, of course, form the beam to be accelerated and focussed onto the anode (or target). In Opera, the physics of emission is contained in a set of models, which we call ‘emitters’. Opera includes a wide range of emission models, or ‘emitters’, the selection of which depends on the material of the emitter, its temperature and the local electric field. Very often in X ray tubes, the electron emitter will be a heated tungsten filament. Users of Opera may make use of measured emission data or include more refined emission physics with user defined emission models. We sometimes also need to include the production of secondary particles from the incidence of other energetic particles –these secondaries might be electrons, or ions or neutral atoms of the target itself. 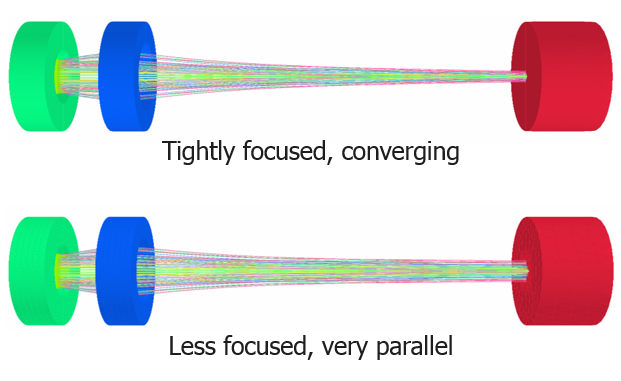 The last two result in performance degradation of X ray tubes, both from target erosion, and from the deposition of target atoms on other surfaces of the tube, such as the window. 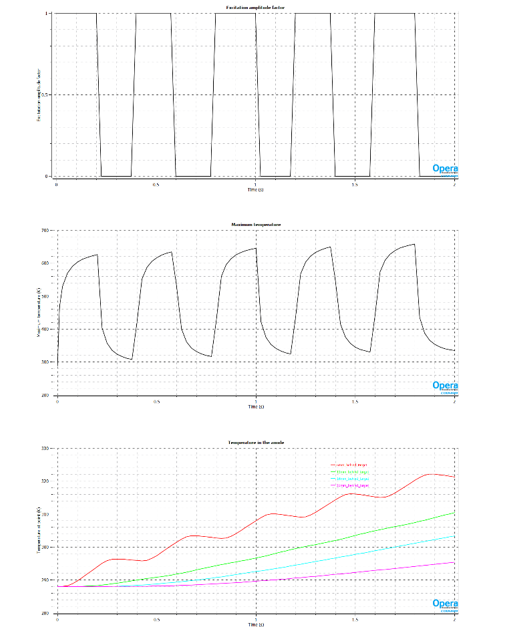 Again, Opera includes models for these, including backscatter and true secondary generation. Surface emitters are usually associated with faces of the model geometry – although we also have a variety of user defined models that can provide source particles from anywhere in the model volume. If a beam is passing through a poorly evacuated region, we have the possibility for interaction between the beam and the species in the gas, akin to processes used in the Crooke’s tube, mentioned earlier. Such volume interactions can be included in the Opera simulations. Naturally, these emission models are associated with volumetric regions in the Opera model. Opera emitters incorporate a number of features that allow models to be created to embody sophisticated physics. These include arbitrary particle charge and mass and functional physical parameters – where the properties of emission can be dependent on the solution variables, i.e. those parameters that are calculated during the solution process, e.g. the local electric field – including the effect of space charge produced by the emitter itself or the incidence angle and energy of particles incident on a secondary emitter surface. Each Opera emitter accounts for either the generation of one species of primary particle, or for the generation of a particular secondary particle from a particular incident particle. However, an arbitrary number of emitters may be co-located on the same physical face, or faces, or in the same volume of a model, allowing arbitrarily complex multi-species interactions to be simulated. The set of in-built emission models is indicated below. As can be seen, primary emission models fall into a number of classes, such as thermionic, field effect and plasma, and we may initiate secondary emission from either surfaces or volumes. Note that the list includes a ‘User Defined Emitter’, which, as mentioned earlier, allows the user to create their own models, and gives the ability to use data from measurement or other sources. As I said before, we should choose the emission models that best represent the behaviour of the emitters being used.We mainly expect to see electrostatic fields in X ray tubes. However, for those instances where we also have magnetic fields present, we can incorporate them in the Opera simulation. The magnetic fields may arise from a number of sources, and may be included in the simulation in a number of ways. Firstly, but by no means most commonly, the electron beam might be intense enough that we need to account for its own self-field. 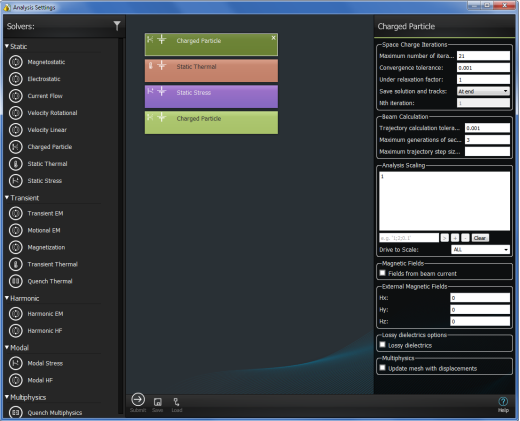 This we can do – simply by switching on the option in the model before running the simulation. More often, we have fields applied from ‘outside’, either intentionally, as in Magnetostatic focussing, or from extraneous sources, or perhaps we want to include, say, the effect of earth’s field. The source of the data might be analytic, from a separate Magnetostatic simulation, or from measurement. In these instances, such fields may be added to the simulation. One point that we should note, of course, is that we need to be careful if we include magnetic fields in a simulation that would normally take advantage of symmetry in the electric field and tube geometry. The presence of the magnetic field can break reflection symmetry that might have existed in an electrostatic-only field model. However, we may often still use rotational symmetry – or perhaps more correctly, rotational periodicity, depending on the device geometry. If we look at what sort of metrics are important to designers of particle beam devices, we might arrive at a list such as this – it is perhaps not exhaustive, and some are less relevant to X ray tube design than others. But generally, these set the requirements for the tools that we need in the Post-Processor. Some metrics are evaluated using standard tools available in the Opera Post-Processor, but where new requirements arise, we can use the scripting capabilities of Opera to provide the needed functionality. As mentioned previously, one very significant output parameter that we might want is the deposited beam power. This is evaluated in an Opera Charged Particle simulation and is available for export, and for subsequent use in, say, the Opera Thermal solver. Note that, although the Charged Particle solver is a static solver, it is possible to simulate the thermal effect of time varying beam – for example a single pulse, or pulse-train – simply by applying a time function to the power loading from the Charged Particle simulation. But let’s first have a look at how we would use Opera’s Multiphysics environment to run a simple continuous beam example. In the Multiphysics environment, we chain the required analyses – simply by dragging the required ones from the Solvers pane below. We apply the model set-up data – such as material properties, boundary conditions, etc -in the Modeller to a single model. All data that needs to be used in a particular stage of analysis is obtained automatically from the results of the preceding stage. All results are available in a single database, once solved.So, for the analyses in which we are interested at the moment, we pass the beam power loading from the Charged Particle simulation to Thermal; the resulting temperature distribution is passed to the Stress analysis to determine the thermal expansion effects. Finally, a second Charged Particle analysis is run using the deformed structure from the Stress analysis. We can see some results from a simple model below. This shows the Charged Particle solution in the left-hand two images, and the resulting thermal and stress results in the two images on the right.As I said before, we can run a transient thermal analysis using the results of a Charged Particle simulation. Let’s take the example of a pulsed X-ray tube. Our main criterion is that the pulse is long enough – by this I mean that the beam reaches steady state in a time much shorter than the pulse duration. We can then assume that the steady state condition applies over the whole pulse duration; and so we can then run a Charged Particle analysis. The beam loading from this can then be applied as the heat input to a Transient Thermal analysis – by modulating the loading with a time function. Although we transfer beam loading data in the form of text files in this case, rather thanusing the standard Multiphysics environment, we can automate the process using Opera’s scripting features. We will use a similar example to that used before, as shown below. We can run a transient thermal analysis using the results of a Charged Particle simulation. Let’s take the example of a pulsed X ray tube. Our main criterion is that the pulse is long enough – by this I mean that the beam reaches steady state in a time much shorter than the pulse duration. We can then assume that the steady state condition applies over the whole pulse duration; and so we can then run a Charged Particle analysis. The beam loading from this can then be applied as the heat input to a Transient Thermal analysis – by modulating the loading with a time function. Although we transfer beam loading data in the form of text files in this case, rather than using the standard Multiphysics environment, we can automate the process using Opera’s scripting features. We will use a similar example to that used before. The Charged Particle simulation provides the beam power loading, which we import into an unsolved Transient Thermal database, with variable name ELEMENTHEAT. We define a time-dependent amplitude factor – here a pulse train with on and off widths defined in this case by the values of the user-defined variables #TAUON and #TAUOFF. With these times both set to 200ms, we run the Transient Thermal simulation for a total of 2 seconds, and extract the maximum temperature in the model, and temperature at a few points some distance from the target every 2.5ms (note that the simulation time-step is finer than this, at 0.5ms). The input pulse train and resulting temperature are shown below. As can be seen, the maximum and the temperature close to the target change rapidly as the pulse switches on and off. Further from the target, the temperature excursions are less, but is all cases, the maximum, or point, temperatures gradually rise over time. Clearly, a steady-state has not been reached, as would have been if the simulation had been allowed to run for more time-steps.Finally, I mentioned previously that Opera’s formulation and efficiency result in fast solutions. This means that we may contemplate optimization, even for large Charged Particle and multi-physics simulations. Opera includes an integrated Optimizer, which enables multi-variable, multi-objective optimization with optional constraints. Since, when we have multiple variables and multiple objectives, there is no one best solution; Opera’s Optimizer uses a Design of Experiments and Pareto optimization scheme to determine a set of designs that are equally optimal. A very simple example might be that of attempting to achieve the smallest focal spot and the most parallel trajectories simultaneously . Additional information on the Opera Optimizer may be found on our website.